On January 24, 1888 the Western Reserve University Trustees authorized President Haydn to establish a college for women. In March President Haydn invited twelve women to his home for an informal meeting to discuss how the college might be launched. From this meeting was created the Advisory Council, a group of women who contributed their time and energy, funds, and influence to ensure a successful start for the new College. 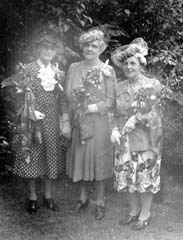 Three of the Alumnae Association founders in 1943. Adelaide Denison is in the center. 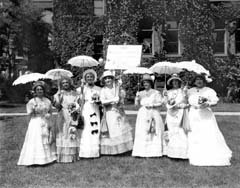 At the centennial celebration of Western Reserve University, Mather alumnae in costume carry a sign that reads, "Say, what's a hundred years to us brave pioneers." The Advisory Council, from the first, worked to engage the interest and support of others in the College for Women. It was only a few years after the College graduated its first student, Mary Louisa French (1891), that an Alumnae Association was founded. Advisory Council President, Isabella Birdsall Morley, was regarded as the force behind the Association, declaring, “The strength of the college is in its alumnae.” In February 1894 the College for Women Alumnae Association was informally organized. Emilie Monck (1893) was elected president and Adelaide Cooke Denison (1893), secretary. Yearly dues were set at $1.00. These two Mather groups, over 120 years, furthered the higher education of women through philanthropy, advocacy, and mentoring. From chaperoning the first College for Women students to raising funds for the full range of Mather College activities to operating the student dormitories, these women were actively engaged in the life of the College. This web site describes just a few of the many examples of their support.